For results you will see immediately, this super-charged day-night moisturizing creme containing 25,000 iu of Vitamin A rehydrates and re-energizes as it reprograms skin to resist environmental stresses. Suddenly, your skin acts like healthy young skin! DN-24 HYDRACREME gives you concentrated protection when UV light and the environment can be most damaging. 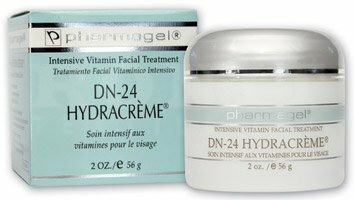 The 25,000 iu of Vitamin A in DN-24 HYDRACREME as well as Vitamins B, C, D and F shield the tissues from destructive particles called free radicals and lessen the risk of skin damage. The broad spectrum sunscreen in DN-24 HYDRACREME protects you from UVA and UVB cellular damage.